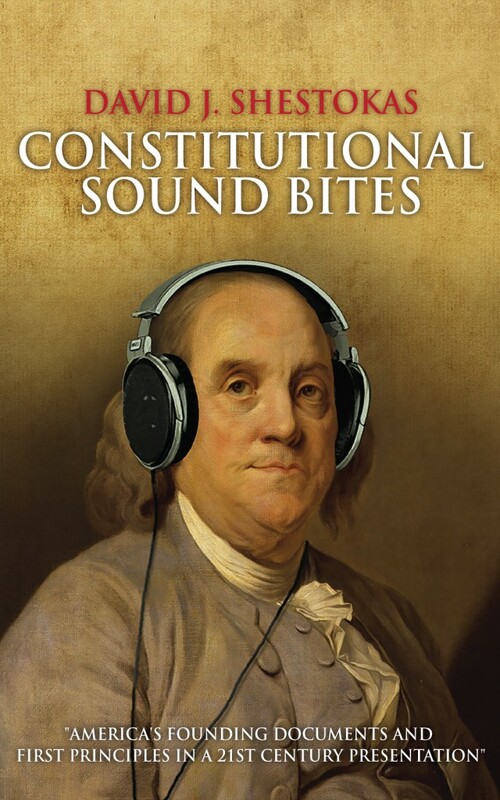 Learn about the Constitution and how it relates to the Declaration of Independence with the Constitutional Sound Bites Series. In the 21st Century, we’ve become used to getting information in small doses of media sound bites, short blog posts and 140 character Tweets. Modern leaders, understanding mass media, beginning with Franklin Roosevelt, (“A date which will live in infamy…”), through Barack Obama (“I don’t want to pit Red America against Blue America…”) have turned this into an art form. The leaders of Revolutionary America understood the communications of their day. After the proposed Constitution was completed on September 17, 1787 the battle for ratification began. Much of it took place in the mass media of the 18th Century: newspapers. Long essays appeared around the country. The most famous of these essays was a series that became known as The Federalist Papers. These 85 articles by John Jay, Alexander Hamilton and James Madison when collected into a book run about 400 pages. While The Federalist Papers (and the newspaper essays written by opponents of the Constitution,) remain good reading, it’s not the way 21st Century Americans get information. If Jay, Hamilton and Madison were communicating with modern Americans, they would have shortened their messages for modern communications, likely into one minute ideas. 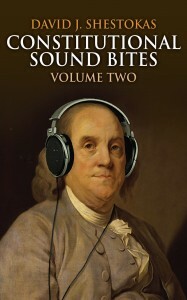 These books contain one minute ideas or “sound bites” about America’s Founding and The United States Constitution and the Declaration of Independence. You’ll learn about the people involved in America’s founding, the philosophy behind the founding documents, and the institutions created by the Constitution. This series consists of “sound bites” about America’s Founding documents and shows these documents to be neither Republican nor Democrat, not liberal or conservative, but American. Nearly seven years ago I started writing for an online magazine about the US Constitution. The responses and comments led me to realize Americans had a strong thirst for a clear and thorough understanding of their rights under their Constitution. The guest writing turned into a personal website, and the website into a radio show. The weekly show, Constitutionally Speaking, the weekly show resulted in the daily feature: “A Minute of Constitutionally Speaking”. Those daily one minute features are collected in this series. Volume One also contains the complete Declaration of Independence and Constitution. Before each “sound bite” is a question the “sound bite” answers. They might be considered constitutional FAQs. The Federalist Papers were written to answer questions. It seemed appropriate that Constitutional Sound Bites would answer questions as well. The web site, the radio show, the daily feature and this series all have the same goal: to explain the origins, purposes and philosophy of America’s Founding Documents. Too often these days Americans either yell at or talk past one another, even though 86% of us agree the Constitution is relevant to our daily lives. We should have common ground in the Constitution! These “sound bites” will help us to share that common ground. 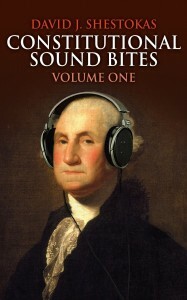 Purchase Constitutional Sound Bites, the Collected Edition today on Amazon. Purchase Volume One today as a PDF download at this link or as a Kindle e-book on Amazon. Purchase Volume Two today as a Kindle e-book on Amazon. 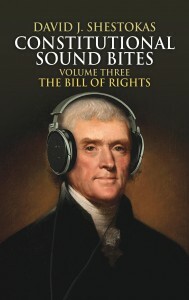 Purchase Volume Three: The Bill of Rights today as a Kindle e-book on Amazon.